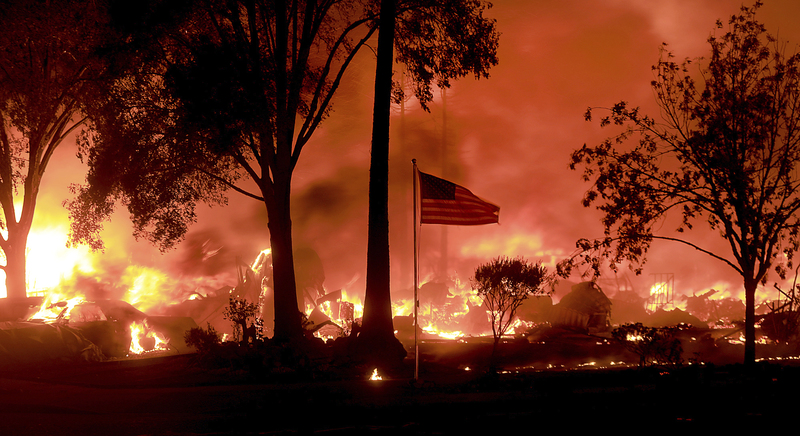 SANTA ROSA, Calif. (CN) – The death toll from nearly two dozen wildfires burning throughout Northern California continues to rise and several fires burning in the Wine Country grew unabated overnight, even as the region braces for another bout of gusty winds on Wednesday. Officials have confirmed 21 fatalities related to 22 large wildfires burning in the region, responsible for the incineration of more than 120,000 acres and the destruction of at least 2,000 structures, including homes, businesses and other buildings. Brown also noted a warming climate means wildfires will continue ripping California with greater frequency and ferocity. Tens of thousands have been evacuated from their homes with the worst damage focused on Napa, Sonoma and Solano counties. Nestled in the quaint bucolic town of Glen Ellen in Sonoma County, the Jack London Lodge is a respite for people looking to get away from the fury of the everyday grind. Roger DeKeyser, the general manager of the lodge, was sleeping soundly after going to bed Sunday night, unaware that a large wildfire was marching toward his hotel full to capacity with guests. DeKeyser and his guests’ peace was broken promptly at 3 a.m. Monday, as deputies from the Sonoma County Sheriff’s Department and other agencies began knocking loudly on the door of each and every room bearing news than an immediate evacuation was necessary. The lodge suffered fire damage and an outlying maintenance building burned to the ground, but was relatively unscathed considering the scale of damage to other properties in Sonoma County, where the Tubbs Fire has laid waste to nearly 30,000 acres and continues to grow. But one of DeKeyser’s housekeepers lost everything when the house in which she was living went up in flames. A bartender at the lodge reported that a house that had been in his family for years was gone along with everything in it. Another bartender had been renting in the area, and he too lost everything as that house was incinerated. 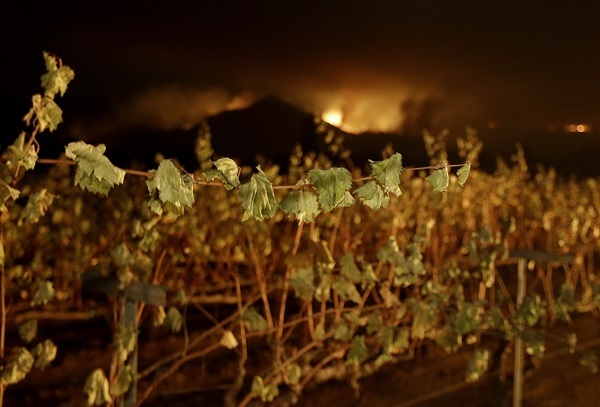 These are just a few of the the stories emerging from California’s Wine Country as an assortment of uncontrolled fires continue to rage in both the wildland area and through developed parts. The Tubbs Fire, which swept through neighborhoods in the Wine Country’s largest city of Santa Rosa, has so far burned 28,000 acres and remains at zero percent contained. Making matters worse, the weather forecast calls for winds out of the northwest, which would blow the fires in the opposite direction of the hastily constructed containment lines. Meanwhile, the Atlas Fire centered mostly in Napa County grew from 25,000 acres to 42,000 acres overnight with only 3 percent containment, according to the latest report from Cal Fire. The Redwood Complex in Mendocino County also grew significantly overnight, expanding to 29,000 acres and burning unabated in a valley just north of Ukiah. Cal Fire Director Ken Pimlott said his agency is using every available resource to address the rapidly spreading fires, deploying 73 helicopters, 30 air tanks, 550 engines and more than 8,000 firefighters. The Atlas Fire has spread into Solano County and continues to burn in areas of Napa County. 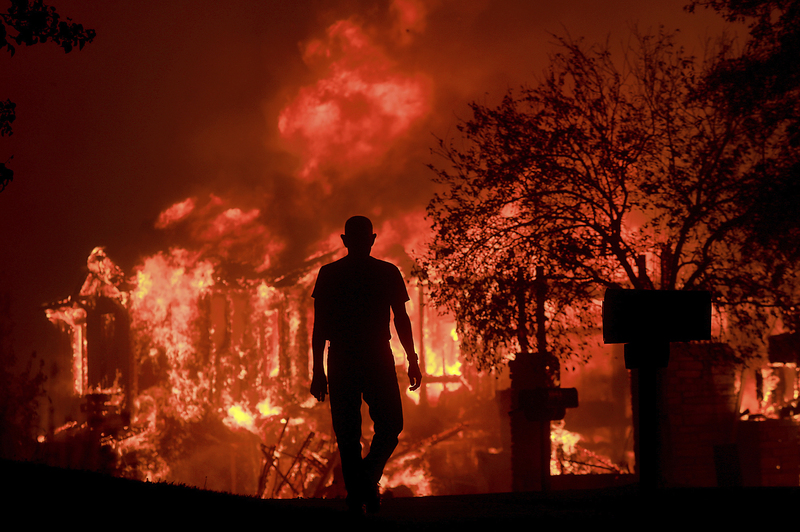 Sonoma County has borne the brunt of the firestorm, with 11 fatalities reported. 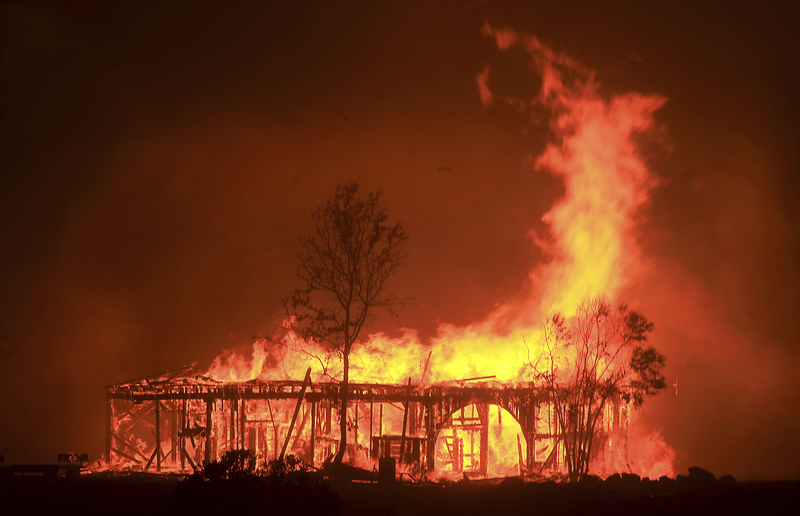 The other deaths occurred in Yuba, Mendocino and Napa counties. Hundreds of people have been reported missing, and while officials remain confident the majority of those people will be located safe they warn the death toll may rise sharply. Pimlott said many of the large Wine Country fires have the potential to merge into a large complex fire. “These fires are moving faster than firefighters can run,” he said. He did offer some optimism, saying fires in Nevada and Yuba Counties are well on their way to containment – meaning resources can be shuffled to large fires still growing in the Wine Country. While Cal Fire remains busy deploying firefighters, building containment lines and attempting to save people and property, reports have emerged of downed power lines and exploding transformers immediately preceding the fires in Sonoma County in particular. State fire officials are investigating the cause of the blazes, but most of their resources are presently directed at containing what some are calling the worst firestorm to ever hit California. “It’s too early to get into the causes of the fire, but we have investigators on scene,” Pimlott said. Officials also confirmed President Donald Trump had declared the wildfires a major disaster area, meaning FEMA could begin dispersing grants and helping with the response. “The federal government will be a good partner and so far, they have been a very good partner,” Brown said.